Want to stay warm? Want to extend your scuba diving season? Then dive dry. A dry suit seals you off from the water and keeps you comfortable, even in surprisingly cold water. There is incredible diving in the world’s cooler regions and in some areas, conditions are even better in colder months. Becoming a dry suit diver allows you to expand your boundaries and dive more places, more often. A rental drysuit is included in this course however the seals are not. BCD, Regulator and Tanks available for rent. 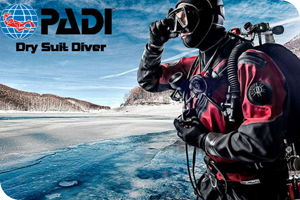 Includes rental drysuit. Dive fees and other rental items not included.